About 300,000 people in the United States fracture their ribs each year, according to Oregon Health and Science University. The pain can be severe and crippling. While many cracked ribs result from car accidents, other activities that can lead to rib injuries include falls, extreme coughing bouts and sports. Rarely do doctors operate on rib injuries. Instead, time, rest and targeted physical therapy programs aid in healing. Most rib-injured patients require a program designed to encourage deep breathing. It hurts to breathe, and the lack of consistent oxygen intake leads to a host of other complications, including pneumonia and collapsed lungs. An incentive spirometer often is utilized in the breathing program. It is a device that measures the depths of your breaths when you breathe through a small connecting hose on the plastic portable device. Stress fractures occur to the ribs when you repeatedly place pressure on your chest from movements specific to your sport. Common activities that result in rib stress fractures include rowing, tennis and pitching a baseball. Rest and avoiding the motions that caused the injuries is required initially. You may need to hold your arm in a sling to prevent pulling the damaged ribs. Once you return to your workouts, you should focus on strengthening your supporting muscles to take some of the pressure off your weakened ribs. 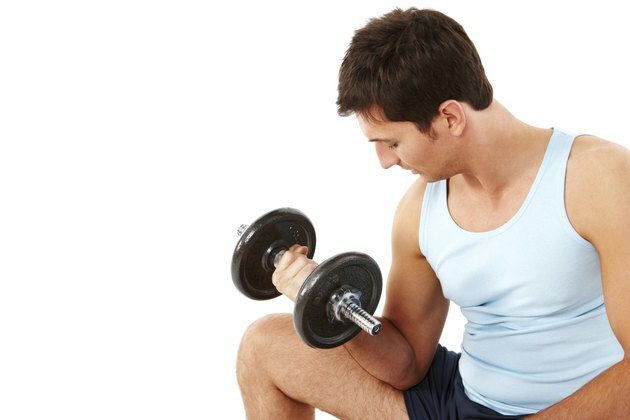 Biceps curls strengthen your arms to take some of the pressure off your ribs when you throw or swing a racket. Core exercises such as crunches strengthen your back and abdominal muscles to ease the stress on the ribs when rowing. There are few exercises you can perform that will speed up recovery from damaged ribs. According to MD Guidelines, it typically takes about six weeks for damaged ribs to repair themselves. The best you can hope for sometimes is to find ways to minimize the pain while you recover. Transcutaneous nerve stimulation units, also called TENS, may be used as part of a rehabilitative physical therapy program to regulate your pain. Electrodes are place over the affected area and painless shots of electricity are transferred through your skin. Medication is prescribed to mitigate the pain of broken and cracked ribs, but other measures may relieve the pressure. Gentle stretching that expands your diaphragm can help when you take deep breaths. Stretching that targets the shoulders and trunk expand your chest cavity to make breathing more comfortable. The stretching also relieves referred pain through your shoulder and back that often occurs after keeping your arm in a sling.